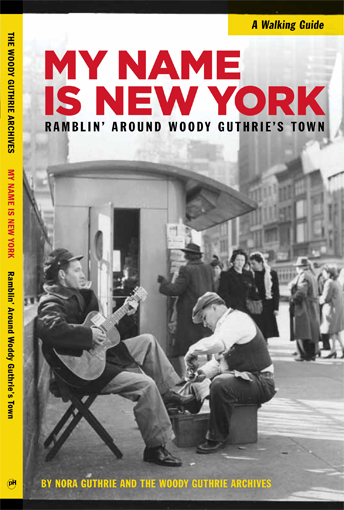 2-CD AUDIO TOUR – 19 tracks highlighting significant locations where Woody Guthrie lived and wrote. A historic audio tour told by those who knew him best. WOODY GUTHRIE lived in New York City from 1940-1967, a total of 27 years. Although he continued to ramble, New York was the city he called home, and always returned to. With friends Pete Seeger, Lead Belly, Sonny Terry and Brownie McGhee, Ramblin' Jack Elliott, and others, he was at the hub of a new movement – introducing and popularizing rural, roots, topical, and protest music to modern urban audiences. THIS LAND IS YOUR LAND was written at a small boarding house on 43rd Street. His autobiography BOUND FOR GLORY and many of his most popular songs were written in various locations around town; JESUS CHRIST, TOM JOAD, VIGILANTE MAN, and RIDING IN MY CAR are among the 600 songs he composed here. Now, for the first time, you'll actually be able to hear these stories told by those who knew him best, in many different ways and through various encounters and circumstances; music partners Pete Seeger, Ramblin' Jack Elliott, Sonny Terry, and Bess Lomax Hawes, Woody's first wife Mary Guthrie, Woody's merchant marine buddy Jimmy Longhi, Bob Dylan, Woody's second wife Marjorie Guthrie, Arlo Guthrie, Nora Guthrie and many others share their memories with you first-hand. With this new audio tour, we invite you to walk the streets, ride the buses and subways, or sit down and relax on some of the stoops, park benches, or beaches where Woody Guthrie did – always strumming away on his guitar, always working on a new song. © Woody Guthrie Publications, Inc. All rights reserved. Artwork by Woody Guthrie.